The Church is suffering greatly—by her own hands. Self-injury, whether by individuals or institutions, invariably involves faulty thinking that is born out of self-deception. 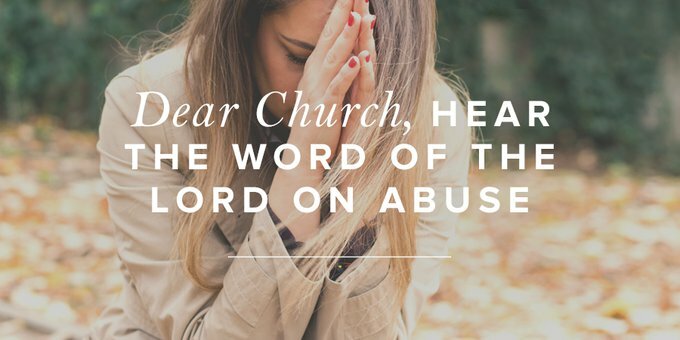 Many of us are grieved at the wreckage in the Church that occurs when victims are silenced, abusers are protected, power is abused, and “truth” is disseminated to the less powerful. The Body of our Lord is sick. Here are some thoughts for her. To begin with, it is important to remember that all power is derivative. The power that is inherent in one’s position, gifting, knowledge, verbal ability, or spiritual authority has one source—all power comes from Christ. He said, “All authority [power] has been given to Me in heaven and on earth” (Matt. 28:18 NASB, emphasis added). It is not ours; it is His and is to be used in accord with His Word and His character. He who had all power never used it to feed on a vulnerable person, to increase His stature, or to protect Himself. Any power we have is His and is to be used to bless others with His grace and truth. Second, God is ever and always, with no shadow or turning, both light and truth. He is Truth. He is Light. Light exposes the truth. It exposes beauty and horror. Clean and filthy. And truth always calls what is exposed by its right name. “Whitewashed tombs . . . full of dead people’s bones” (Matt. 23:27) is both exposure and truth. To cover up or even slightly shade, deceive, or rename anything the light exposes is ungodly. The Light does not flinch. The Truth does not water down. You see, it is only light and truth together that expose the cancer, call it by its right name, and enable healing to occur. Third, light and truth require transparency—which simply means letting light pass through so that what is hidden can be distinctly seen. Transparency is the opposite of complicity, which means to be folded up with. That means when sin is named light is needed. We do not like it. Neither did Adam and Eve whose immediate response was to hide. We prefer hiding and damage control. God calls us to the truth and light of transparency. Transparency protects both alleged victims and alleged predators from the horrific burden of lies. A transparent process protects truth for all. When those in power attempt to dissemble in order to protect an institution, they are no longer accomplishing damage control. They are causing damage—damage to God’s precious sheep and damage to the name of our God—this, in the name of protecting the house of the Lord. That is what the Israelites said in Jeremiah—“the temple of the LORD” (Jer. 7:4)—all the while throwing their children, the vulnerable ones, into the fire of Molech. God’s response was to destroy the temple system He ordained and designed and cast His people across the earth. Fourth, words matter significantly. To call alleged victims liars is an attempt to determine outcome without knowledge. We are to call things by their right name. And as people of the Book, we acknowledge that the human heart is utterly deceitful and our own is incomprehensible to us. That means we do not trust our own motives and hearts. It means we do not automatically assume our leaders, no matter how beloved, are telling the truth. And we certainly do not assume the vulnerable ones are liars. Fifth, oh we say, but what about God’s grace and mercy? It is indeed vast, and I am utterly grateful that I can stand in that myself. However, grace and mercy never, under any circumstances, tolerate sin—for it is the terminal illness that is slaughtering humanity—people God knit together, loves, and died for. He will not budge an inch when that disease has a toehold in any human being. Cancer multiplies and spreads and kills. One cell is too much. Tearful apologies are not sufficient—only radical surgery. We fail to love those who abuse when we do not grasp this truth. Sin, like cancer, starts small and spreads, and treatment knocks a life over. God’s love and mercy, like that treatment, will do the same. Sixth, God’s people are called to humility. That means church leaders must recognize the potential for bias that is inherent in their positions. A fundamental understanding of our own capacity for self-deception requires that we avail ourselves the independent scrutiny of those that are not part of the institution. That also means we see that all power is derivative and that any power used to feed the self in some fashion is not godly—no matter the attendance numbers, the money coming in, the books published, the gifting, the brilliance, or any other thing. Humility bends down, becomes like, leaves glory, washes feet, and ever and only listens to the voice of the Father no matter the cost. Finally, dear vulnerable ones, those used, silenced, and cast aside—know that Jesus is often not like His Church. He loves and calls us to truth and light, transparency and right naming. He Himself is the One who bends to tend and care for you when His Church does not. He weeps—not only over you and your suffering at the hands of those who name His name—but also over His Church saying, as He did over Jerusalem: “Would that you, even you, had known on this day the things that make for peace! . . . you have made [my house] a den of robbers” (Luke 19:42, 46). This post is adapted with permission from an article on Dr. Langberg’s website. Previous Post Older Woman, Stand Up and Be a Dorcas!